What Works is a must-read manual for promoting gender equality in the workplace - where you can really make a difference and where you can't. For those who think that gender inequality in the UK is just a pipeline issue that will surely resolve itself in time, What Works may come as quite a shock. As chapter one says, 'unconscious bias is everywhere', affecting even those who are trying hard to avoid it. If you don't believe it, take 10 minutes to empty your head and try out https://implicit.harvard.edu/. I found myself splutter in disbelief as I carried out this Harvard test. I am a mother of twin girls and recently returned to work, while my husband does his stint of our shared parental leave. I am a firm believer in gender equality. Why oh why therefore was I tripping up in this rapid-fire test that asked me to associate men's names with family words and women's names with career ones? Rather depressingly, Iris Bohnet points out that 'unlearning' our biases is 'basically impossible'. But this book is not about being judged - 80-90% of our brain apparently works unconsciously. Nor is it about raising awareness or ridding people of bias. Despite $8bn being spent every year on diversity training by corporations in the US, Bohnet suggests such courses are unlikely to change attitudes, let alone behaviour. Rather What Works is about creating structures and signposts that can nudge individuals in the right direction; practical steps that will change the organisation (not the individual) and quietly but simply level the playing field. Bohnet starts with the example of blind auditions. The Boston Symphony Orchestra found that by introducing a simple screen to auditions, the chance of a female musician making the cut increased by a massive 50%. The book is quick to point out that it won't always be so easy to find a solution, but it methodically takes us through corporate challenges, such as how to recruit, evaluate and negotiate with staff, without allowing our human biases to creep in. The team at Google is - as usual - recognised as being ahead of the curve. Its People Operations department has for some time been replacing managers' intuitive decisions with data and experimentation. They can then analyse it to determine what will really keep their workforce happy and at its most efficient. While there are some depressing insights in What Works, there are plenty of uplifting ones too. 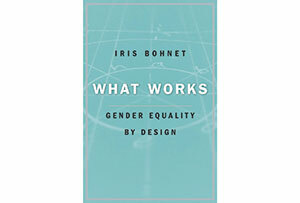 In a chapter on competitiveness, Bohnet explores how to construct and manage teams taking into account the myriad experiments in the US and the UK that have shown that women are less likely to guess, less likely to take risks and less likely to back themselves or push themselves forward when in a mixed group. But Bohnet caveats her suggestions by noting a recent experiment carried out by the Stockholm School of Economics. The test involved sevento 10-year-olds in Sweden competing in traditionally feminine or masculine activities. Thankfully, the results showed that across all the different activities, girls and boys were equally competitive. Each year, the World Economic Forum publishes its Global Gender Gap Report, showing where countries rank on gender equality indices such as labour force participation, earned income and wage equality, participation in management ranks, educational attainment and political empowerment. In 2015, Sweden ranked number four in the world behind Iceland, Norway and Finland. The UK came in at number 18, the US at 28 and Saudi Arabia at 134. I found it really reassuring that those ahead of us are showing that results are achievable. And Bohnet ends by encouraging us all to be 'norm entrepreneurs'. Just as we have seen a generational change with the social norms around smoking in public, so we can each take action to change what is perceived to be 'normal' about the roles women and men play in society. From Maria Neophytou's Great Initiative to the cast of brilliant women in Star Wars - heroines, villains, old and young - we can celebrate the disruption of gender stereotypes. This book is easy to follow with helpful summaries and an inspiring finish. I would highly recommend that anyone who manages people gives it a go. It is stuffed with experiments and data drawn from all over the world. And while the sheer number of examples can be a little too much at times, this is a must-have guide for anyone in charge of a diversity budget.